Remember when you were a kid and graduated from reading books with lots of illustrations to books with nothing but text? You felt so grown up? But there were times when you secretly wanted books where you could just look at the pictures. Then, as you got older and busier, you barely had time to browse through the photos in magazines? Now you can indulge in your love of both because there are so many books out there that combine text and illustration in innovative ways. 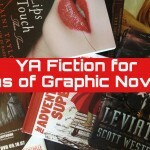 Comic books and graphic novels fit the bill, but I’m not considering them here. In these books, the text and accompanying illustrations complement each other in a seamlessly intertwined and integrated way. 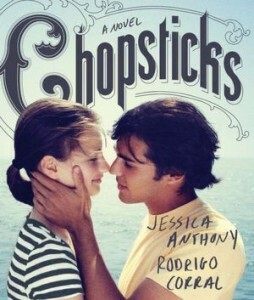 A new, radical example of this is the new teen book Chopsticks by Jessica Anthony, illustrated by Rodrigo Corral. It doesn’t have much text except for graffiti and the words on objects in the book, like the TV screen, newspaper articles, photo album captions, postcards, letters, playbills, sheet music, invitations, IMs, emails, song titles, artwork, etc. The premise of the book is the disappearance of a talented teenaged piano prodigy, Glory, from the rest home where she was living, trying to recuperate from exhaustion due to a strenuous concert tour. After her mother’s death, she’s been raised by her father, who strictly enforces Glory’s piano studies and concert schedule. When Frank, a cute guy from Argentina moves in next door, Glory falls for him and gets distracted from the piano. Missing Frank, and feeling like a virtual prisoner while on tour abroad, Glory starts to fall apart and eventually can only play Chopsticks to the exclusion of anything else–all of this leading up to her disappearance. 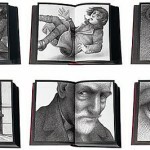 But, in looking closely at the illustrations, another story is revealed, showing that nothing is as it appears. The reader is left to interpret what’s really happened. The alternative is haunting and unforgettable. I guarantee that anyone who reads it will end up discussing it with others about what they really think happened. There’s also an app that you can buy that includes links to embedded videos, links to playlists, hidden scrapbook mementos, moving images in the photos, etc. 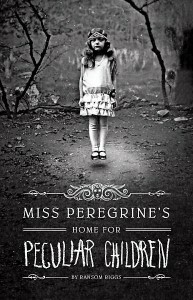 Another fascinating YA book from 2011 called Miss Peregrine’s Home for Peculiar Children by Ransom Riggs (2012 Best Fiction for Young Adults) is as strange and compelling as its title. It incorporates actual vintage photos–strange and creepy ones of such subjects as a turn-of-the-century-era girl levitating, a boy encased in bees, a figure without a head, a baby-faced dog, and many others. If you’ve seen the cover, you won’t forget it. In the book, Jacob’s grandfather tells him that the people in these old photos actually existed. He knew them when he was living in an orphanage off the coast of Wales as a child during WWII. Jacob believed him when he was a child, but now that he’s 16, he realizes they were just fantastical stories. Then, one night his grandfather is killed by a monster that only Jacob can see. No one believes him, and he begins to doubt it himself until he travels to the island and finds out the truth. He discovers a portal that’s a loop in time. When he enters it, he’s taken back in time to September 3, 1940, and he finds that the children in the photos are still alive and look exactly the same. They’ve got special talents like the ability to be invisible, conjure fire, and levitate. He’s got to try to help them outwit the monsters who want to harness the talents of the entire world’s time manipulators and enslave all the common people. 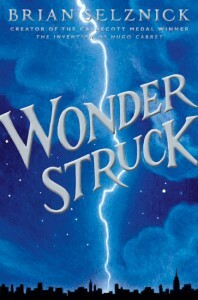 There are numerous other YA books that effectively combine text and illustrations, with Wonderstruck (2012 Best Fiction for Young Adults) by Brian Selznick being a perfect example. I can’t imagine a better book that shows how integral the illustrations are to the text than this or Selznick’s The Invention of Hugo Cabret. 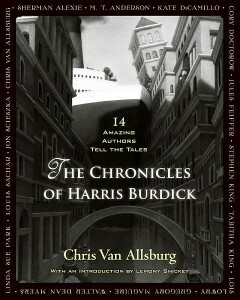 The Chronicles of Harris Burdick: Fourteen Amazing Authors Tell the Tales, edited by Chris Van Allsburg (2012 Best Fiction for Young Adults), features short stories written by an illustrious group of 14 writers to accompany the illustrations of the enigmatic artist Harris Burdick. These mysterious illustrations were first introduced in Van Allsburg’s 1984 collection The Mysteries of Harris Burdick. The authors in this new book include M.T. Anderson, Sherman Alexie, Cory Doctorow, Louis Sachar, Tabitha and Stephen King, and Walter Dean Myers (among others) and range from funny to creepy–and everything in-between. Twice Told: Original Stories Inspired by Original Art with drawings by Scott Hunt (2007 Best Books for Young Adults) is an older YA book, but a fascinating one. 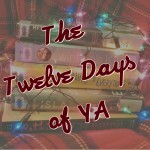 Eighteen authors, each one an outstanding voice in YA literature (John Green, Nancy Werlin, David Lubar, Alex Flinn, M.T. 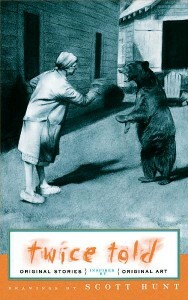 Anderson, and Sarah Dessen for example) used one of Hunt’s charcoal drawings as an inspiration for a story. Pieces by two different authors are paired with each piece of art, proving that no two people see the same thing when they look at a piece of art. Each author has interpreted the art in a different way and written a totally different story. Interestingly, there’s an illustration of a child in a bunny costume in both this book and in Miss Peregrine’s Home for Peculiar Children. These are just a few of the books where the striking text and illustration have stayed with me since reading them. I’d love to hear what some of your favorites are. Next Post Coming Soon: Best of the Best Reading Challenge! It’s nice to see Twice Told getting mentioned. It was a lot of fun to do a story based on a drawing, and even more fun because I was paired with Neal Shusterman. I’m glad the book still has some visibility. This was an interesting piece about what seems like a new trend to me. Thanks. Every you, every me was an amazing book with pictures in it. @Renee. Thank you! I’d forgotten about David Levithan’s book Every You, Every Me. I haven’t had the chance to read it yet. It’s really good my favorite of all of his books by far.